A painting hangs in the Whitechapel Art Galley and is viewed through binoculars from the Cass School of Art on the opposite side of Whitechapel High Street. The painting is a view from inside the ‘Creative Studio’ in the gallery. 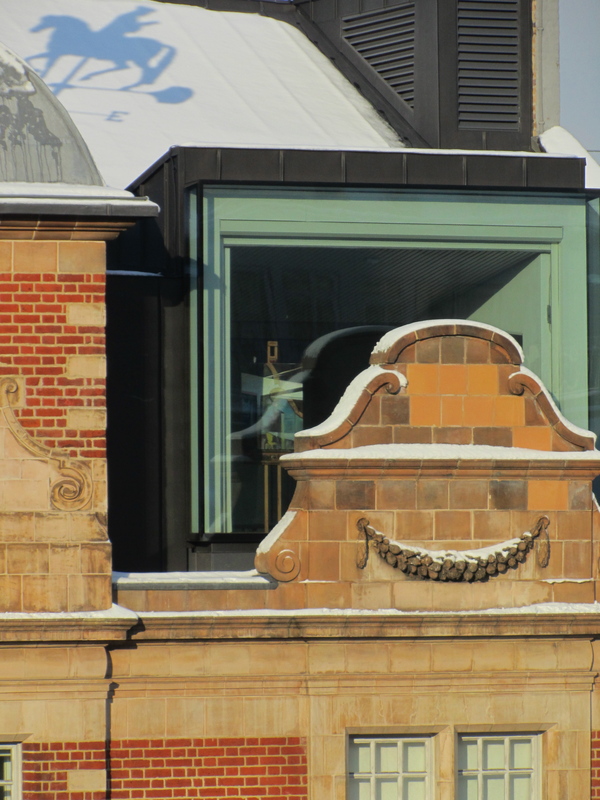 It shows the steel props that support the decorative stone gable on the façade of the Whitechapel Gallery. The painting is like a mirror exposing a secret to neighbour opposite; The work expresses how we present a façade to others. From the Cass, the painting seems excluded – ironically not what happens to a painting when it is exhibited in the Whitechapel. This work is a symbol of a link between two institutions: The process of making the work formed a connection between two people, two buildings, two organisations. For view through binoculars click here, and for painting click here.